It will be the first total solar eclipse in the contiguous U.S. since 1979. People across the country are counting down the hours until the total solar eclipse will arc across the continental United States for the first time in decades. Here's everything you need to know about this rare and striking astronomical event that you won't want to miss. A total solar eclipse is when the moon moves between the sun and Earth, lasting for nearly three hours from beginning to end, according to NASA. The lunar shadow will darken the sky, temperatures will drop and bright stars will appear at a time that is normally broad daylight. Retired NASA astrophysicist and photographer Fred Espenak said the experience usually lasts for just a few minutes, but it's truly out of this world. "It is unlike any other experience you've ever had," Espenak, popularly known as Mr. Eclipse, told ABC News. "It's a visceral experience; you feel it. The hair on your arms, on the back of your neck stand up. You get goosebumps." "You have to be there," he added. Espenak said a total solar eclipse can last as long as seven minutes. For Monday's eclipse, NASA anticipates the longest period -- when the moon obscures the sun's entire surface from any given location along its path -- will last about 2 minutes and 40 seconds. (NASA) The diagram shows the earth-sun-moon geometry of a total solar eclipse. There are four main types of solar eclipses: partial, annular, total and hybrid. According to NASA, total solar eclipses occur once every 12 to 18 months while partial solar eclipses, when the moon blocks only part of the sun, occur more frequently, though visibility varies. The total solar eclipse on Monday is particularly rare because it's the first time since June 8, 1918, that the path of totality exclusively crosses the continental United States. It's also the first continent-wide eclipse to be visible only from the U.S. since 1776. "That's the really unique thing," Espenak told ABC News. "It's not a particularly long total eclipse. It's not an especially wide path of totality, but it crosses the U.S. and no other country." The last time the contiguous United States saw a total solar eclipse was Feb. 26, 1979, when the path of totality only crossed the Pacific Northwest. ABC News' Frank Reynolds anchored a special report on the celestial phenomenon at the time and pledged that the network would cover the next total solar eclipse in 2017. “So that’s it -- the last solar eclipse to be seen on this continent in this century. And as I said not until August 21, 2017, will another eclipse be visible from North America. That’s 38 years from now. May the shadow of the moon fall on a world in peace. ABC News, of course, will bring you a complete report on that next eclipse 38 years from now,” Reynolds said before signing off. 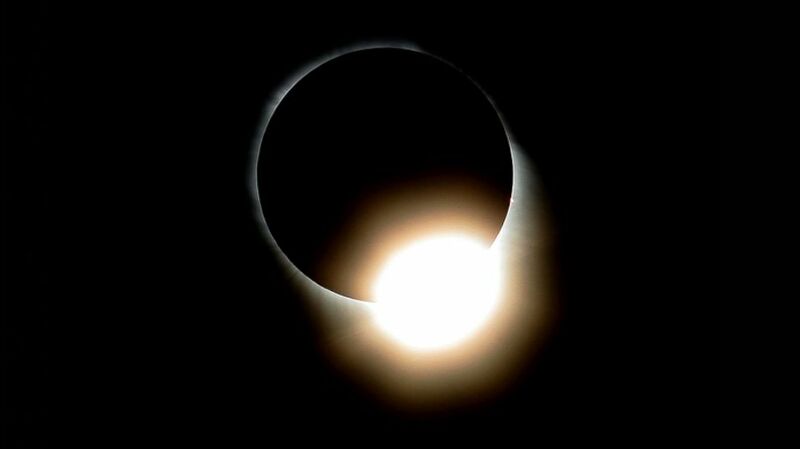 (Jamie Cooper/SSPL via Getty Images) A "diamond ring" shape is pictured during the total eclipse, March 29, 2006 in southern Turkey. NASA estimates more than 300 million people in the United States potentially could directly view the total solar eclipse on Monday. The relatively thin path of totality will sweep across portions of 14 U.S. states: Oregon, Idaho, Wyoming, Montana, Nebraska, Iowa, Kansas, Missouri, Illinois, Kentucky, Tennessee, Georgia, North Carolina and South Carolina. 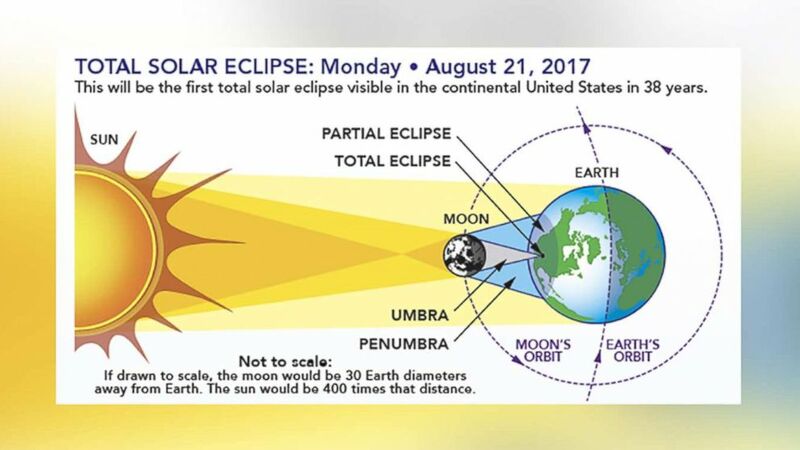 However, a partial solar eclipse will be visible in every U.S. state on Monday. In fact, everyone in North America, as well as parts of South America, Africa and Europe, will see at least a partial eclipse, according to NASA. (NASA) This map shows the globe view of the path of totality for the Aug. 21, 2017, total solar eclipse. Where can you witness it? You must be in the path of totality to witness a total solar eclipse. The path of totality for Monday's solar eclipse is a 70-mile-wide ribbon that will cross the United States from west to east. This stretches from Lincoln Beach, Oregon, at 9:05 a.m. PT to Charleston, South Carolina, at 2:48 p.m. ET. From there, the moon's shadow leaves the country at 4:09 p.m. ET. NASA anticipates the total solar eclipse to last longest near Carbondale, Illinois, about 100 miles southeast of St. Louis, where the sun will be completely blocked for about 2 minutes and 40 seconds. Espenak, a scientist emeritus with the NASA Goddard Space Flight Center in Greenbelt, Maryland, said weather plays a big factor in the eclipse's visibility. "It all boils down to what the weather is going to do," he told ABC News. "Any place along that path can be clear or cloudy on eclipse day." And you don't have to be on the ground to witness a total eclipse. Steven Hawley, a former astronaut and senior manager at NASA, watched his first one in 1979 from an airplane while flying at an altitude of 43,000 feet. "We were flying through the [lunar] shadow. You could kind of see the shadow on the Earth's surface," Hawley told ABC News. "It's a unique perspective." When can you watch it? 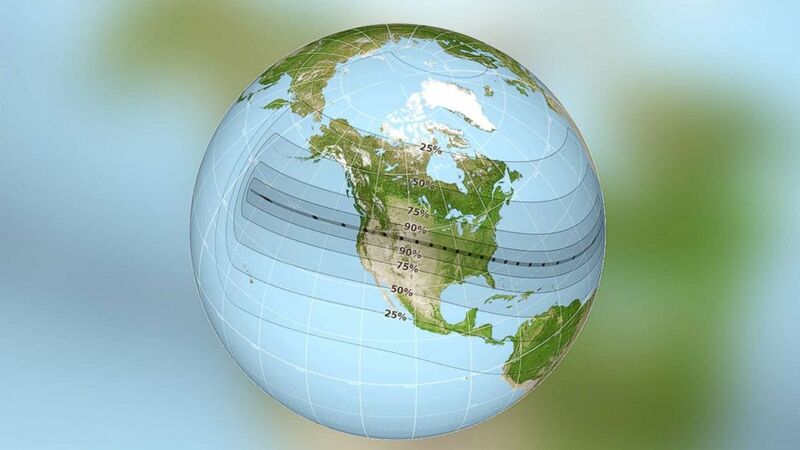 NASA has an interactive map that shows the times for the partial and total eclipse anywhere in world. The path of totality crosses over portions of many major cities. In Salem, Oregon, the eclipse starts at 9:05 a.m. PT and totality begins at 10:17 a.m. PT, lasting for roughly 2 minutes. In Idaho Falls, Idaho, the eclipse starts at 10:15 a.m. MT and totality begins at 11:33 a.m. MT, lasting for just under 2 minutes. In Casper, Wyoming, the eclipse starts at 10:22 a.m. MT and totality begins at 11:42 a.m. MT, lasting for less than 3 minutes. Espenak, who lives in Portal, Arizona, told ABC News he plans to travel to Casper to watch the eclipse as long as clear skies are in the forecast that day. In Jefferson City, Missouri, the eclipse starts at 11:46 a.m. CT and totality begins at 1:13 p.m. CT, lasting for roughly 2 minutes. In Nashville, Tennessee, the eclipse starts at 11:58 a.m. CT and totality begins at 1:27 p.m. CT, lasting for a little under 2 minutes. In Columbia, South Carolina, the eclipse starts at 1:13 p.m. ET and totality begins at 2:41 p.m. ET, lasting for less than 3 minutes. Hawley, a professor of physics and astronomy as well as the director of engineering physics at the University of Kansas, advised booking any travel tickets and hotel reservations way ahead of time and to expect plenty of traffic on the road. "I'd recommend having a plan," said Hawley, who lives in Lawrence, Kansas, but plans to watch the eclipse from Jackson, Wyoming. 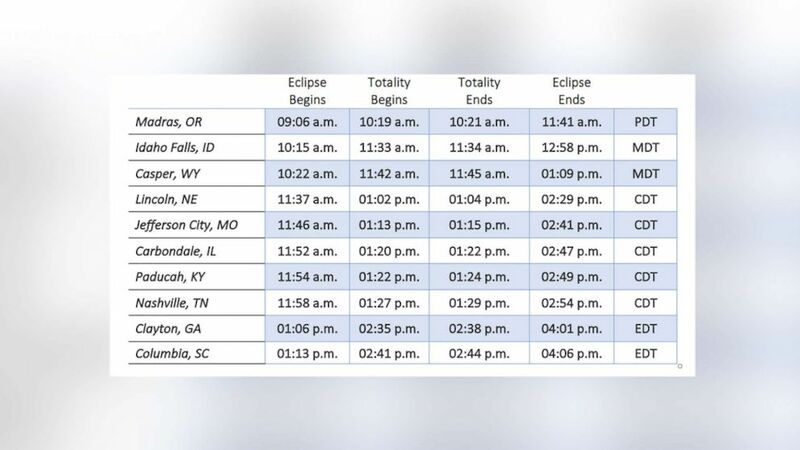 (NASA) The table shows eclipse times for cities in the path of totality. You never want to look directly at the sun, but there are plenty of ways to safely view an eclipse of the sun, including special-purpose solar filters, such as “eclipse glasses” or handheld solar viewers. Not be used if they have scratched or damaged lenses. Ordinary sunglasses -- even very dark ones -- should not be used as a replacement for eclipse viewing glasses or handheld solar viewers. NASA has teamed up with medical and science professionals to provide additional safety information and alternative methods for safe viewing. For more information, click here. According to the American Astronomical Society, a number of manufacturers have certified that their eclipse glasses and handheld solar viewers meet the ISO 12312-2 international standard for such products. Over 6,800 libraries across the country have been distributing safety-certified glasses for Monday's eclipse, with many collaborating with scientists to hold viewing events and activities before and during the event. For eclipse chaser Espenak, who has witnessed 27 total solar eclipses, the experience never gets old, and each one is special in its own way. In fact, Espenak met his wife while watching an eclipse in India about 20 years ago. "If you have an opportunity to get into the path of the eclipse, it's definitely an item that should be on everybody's bucket list," he told ABC News. "It's one of the most remarkable, most spectacular naked-eye phenomena that you can see." "It's something you remember your entire life, and you will tell stories to your grandchildren about it," Espenak added. "It's that important."